Instantly stream or download your favorite Jiu Jitsu videos by the world's best BJJ athletes from your Digitsu library at no additional cost. On your way to work, going to the gym or at the gym, the Digitsu mobile application is the best on-the-go for the modern Brazilian Jiu Jitsu enthusiast. 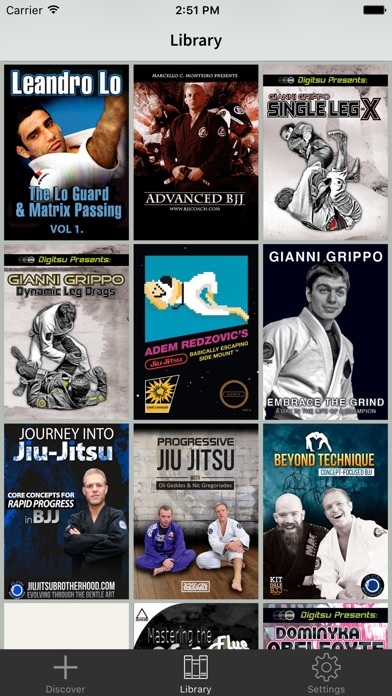 Features: • View and purchase BJJ video from world champions and internationally renowned athletes including: Lucas Lepri, Gianni Grippo, Bernardo Faria, Abmar Barbosa and many more. • Login to access your existing Digitsu on-demand library. • Instant HD quality streaming. • Digital download option for offline playback. How does Digitsu work? • With this mobile app, you can access your Digitsu library, purchase new titles, and add various titles to your wish list. • Browse our growing selection of sensational digital format titles. • Watch preview video of products you don't own. • Rate your favorite instructional series and tell us what you like so that we can further improve your experience. My favorite jiu jitsu app! Great high quality instructional videos! Love the different platforms that are available, and most of all access through Apple.tv. Super awesome! Professionally put together videos of world champions. The video, audio, and editing are expertly done. The content is top notch. Multiple time world champions showing their moves that they actually use in training and in tournaments. My friend asked me why I would pay for BJJ videos when there are so many free instructional videos on YouTube. The bottom line is you get what you pay for. Who is that guy you are watching and trying to learn from? Is he a proven expert or some unknown guy with a camera on his phone. Is the technique shown from multiple angles in slow motion and real time? I don't know about you but I don't have time to waste. I'm not going to waste my time watching and training techniques from somebody who may or may not have something good to show. I want the sure thing. And this is it. Hands down the best app for BJJ. Great app if your a jiu- jitsu lover like myself this app is a must get. Set back enjoy the lessons and keep rollin rollin rollin. Such an easy app to use. Digital has some really great videos and with this new app they are stepping it up a notch. This is a must have app for any bjj practitioner. WOW! This is an amazing app! Seriously all of their instructional material available in one app. The downloads are super fast.